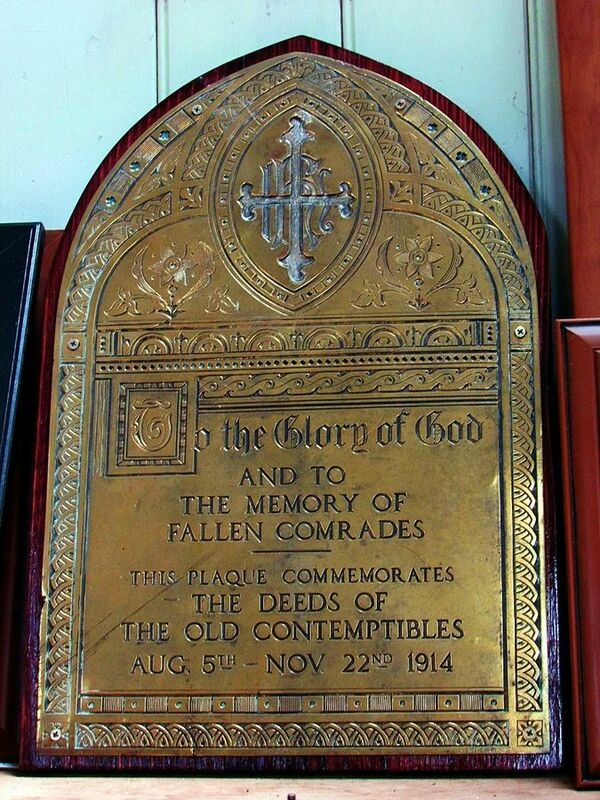 A brass plaque commemorates the deeds of the "Old Contemptibles" and is in memory of fallen comrades who served in World War One during the period between 5th August and 22nd November 1914. The name 'Old Contemptibles' arose from an Order of the Day issued by the Kaiser, which mentioned 'Sir John French's contemptible little army'. All ranks of the British Expeditionary Force (BEF) who served in France and Flanders within range of the enemy artillery during the period 5th August to 22nd November 1914 were entitled to call themselves 'Old Contemptibles'. The Old Contemptibles Association was founded by Captain J.P. Danny, RA on June 25th 1925. The Association had 178 branches in the United Kingdom and 14 overseas branches. It produced its own magazine The Old Contemptible and all members were known as "chums". Note: A plaque commemorating "The Old Contemptibles" who fell during the First World War was unveiled by the Governor of Victoria, Sir Winston Dugan in the Cairns Memorial Church, East Melbourne on the 7th March 1948. (The Age, Melbourne, 8th March 1948). The Cairns Memorial Church was destroyed by fire in 1988 and it is unknown by Monument Australia if this is the same plaque. The plaque unveiled in 1948 bears the same wording as the plaque listed .